Hello again!!! 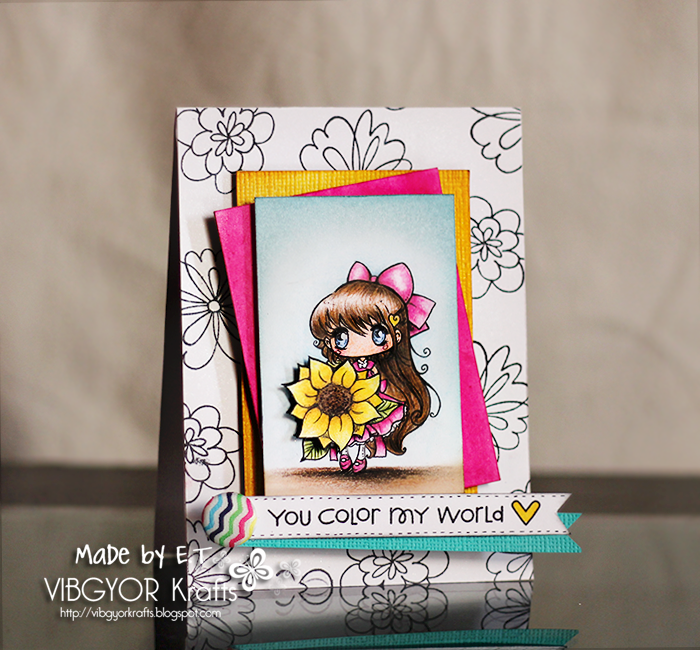 The challenge over at Lia Stampz is a color chart and such beautiful combination I tell you! 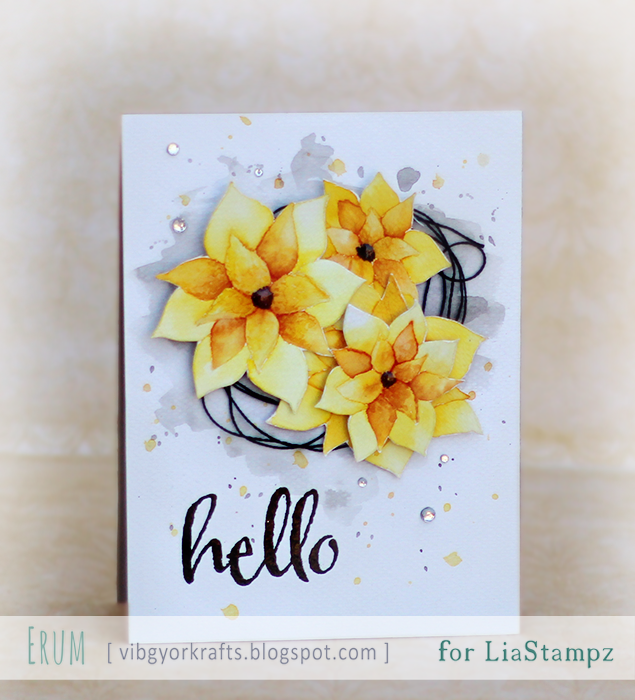 I absolutely LOVED making this card and I wanted to keep it really clean and simple but also add some dimension to it so I fussy cut the flowers and layered them. Since they are digi stamps you can play around with various sizes. I think I have used three sizes of flowers here! Stamps used: Poinsettia Flower by Lia Stampz, sentiment by Winnie and Walter. Hello everyone!! 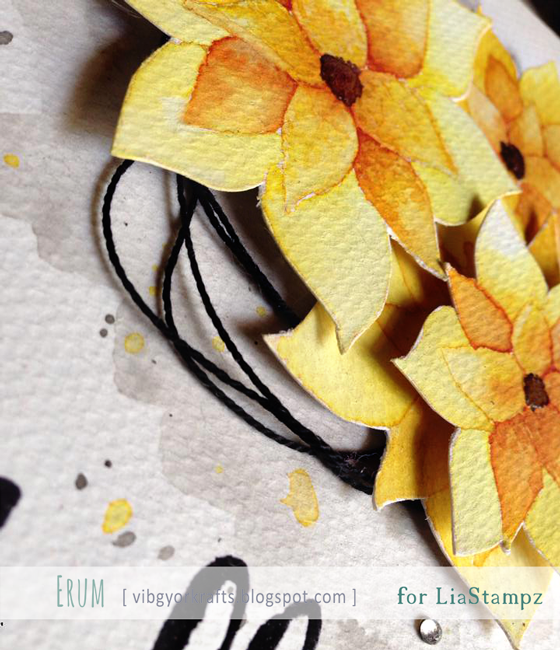 It's time again for a new challenge over at Sentimental Sundays and this week the theme is Springtime Flowers! 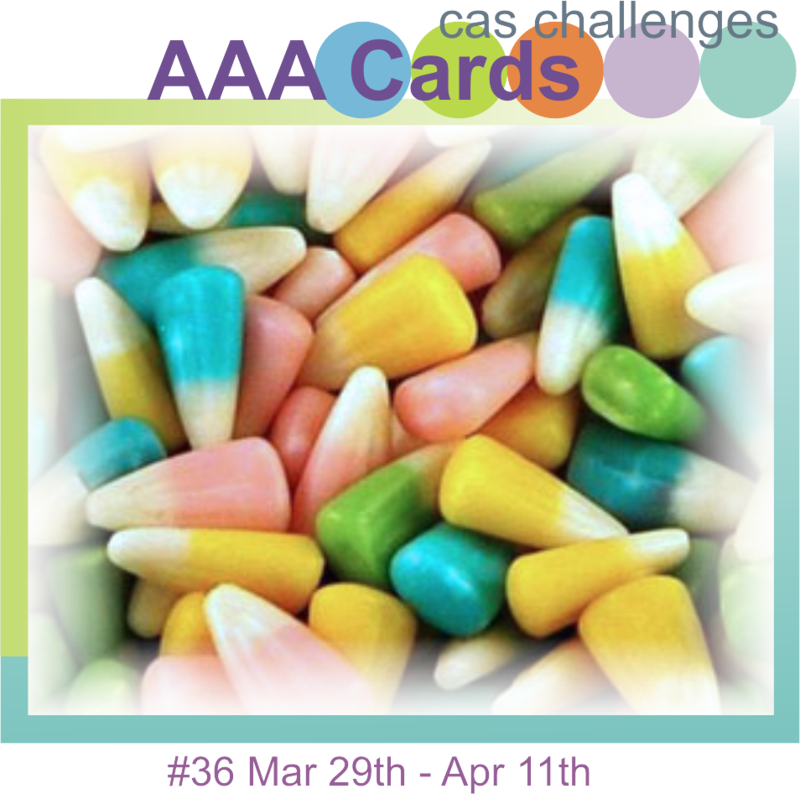 I have been having a good week creating CAS cards! Today I have a very different-for-me card to share. 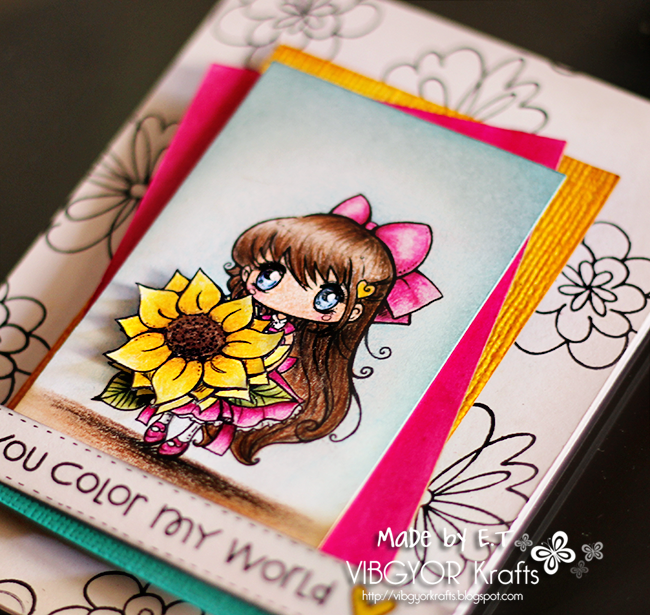 I started with stamping the Hero Arts blooms on the background, sprayed shimmering mist generously! Added yellow and pink layers for a bit of color, placed my image on top. To add a bit of interest to the image, I fussy cut just the sunflower from the image and popped it over the image. The image has been colored using faber Castell classic color pencils and was donated by our sponsor this week Star Stampz (info below). Sentiment by Paper Smooches, brad by BasicGrey. I will love it if you would leave a bit of love! Will stop by everyone's blog in a couple of days! Hello everyone!! 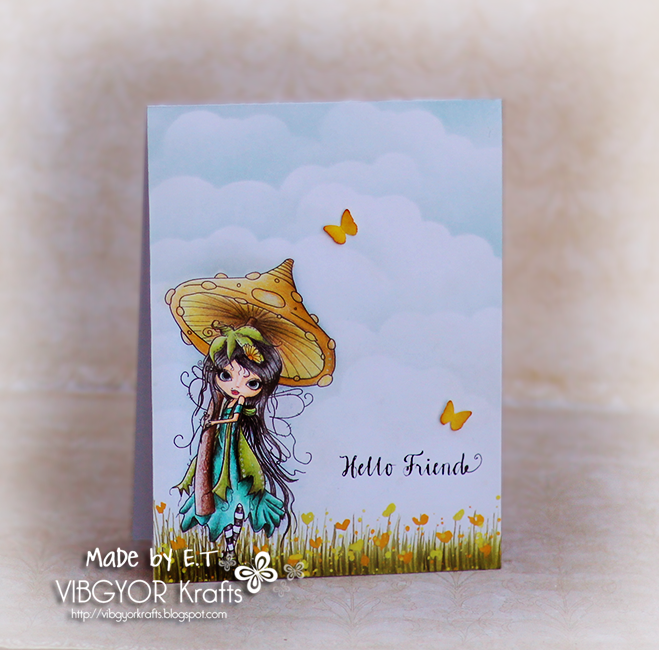 I have a brand new card to share with you today which I just made. 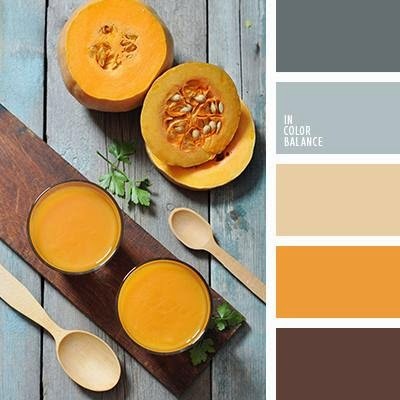 It's based on the challenge over at Runway Inspired and I loved the inspiration pic. This card was my second attempt, in the first one I added orange to the background and it was NOT working for me so I chose to add just a splatter of orange and wee bit of silver embossing. 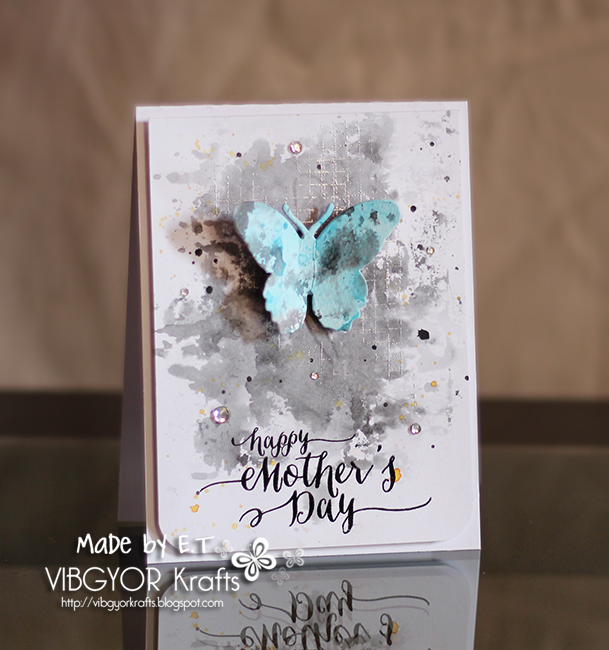 Created the watercolor using Distress Inks, stamps by Kaisercraft and Wplus9. We have such a perfect theme over at Sentimental Sundays this week! It's Fairies or Fairy Tales! Perfect timing with the release of Cinderella the movie! I have not watched it yet but plan to, very soon! Because our sponsor (polka doodles) gave us such amazing images to use, I chose to keep my card simple and focus on the image Octavia Moonfly Wistful. I have colored her using Faber Castell color pencils, add a watercoloured element by painting freehand grass and flowers to match her look. Hey everyone!! 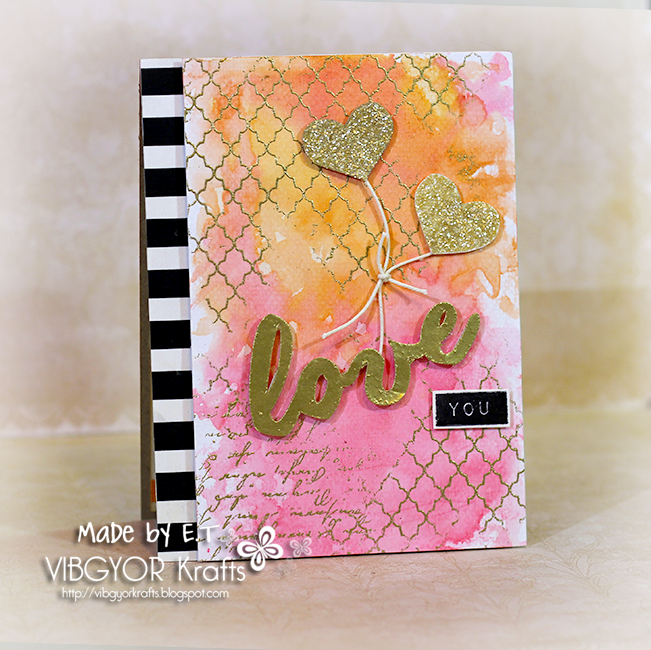 The challenge over at Sentimental Sundays is Anything Goes this week! WOOT and double WOOT for our sponsor Rick St. Dennis!! Since it was an anything goes challenge, I chose to follow the theme at Virgina's challenge which is embossing, chose Cornelia as my muse at Stamploration and following the RIC for inspiration (photo below). My card has gold heat embossed background and the Silhouette cut word "Love". Stamps used are Altenew and Hero Arts. Watercoloured the background using distress inks. The heart shaped balloons are hand cut and glittered using distress glitter.